Item # 180082 NEW-YORK EVENING POST, 1806 A lot of 6 issues with the front page having at least 4 ship ads, each with a small woodcut of a ship. All issues are in overall good condition, with only minor foxing and rubbing, but may be close-trimmed at the margin. 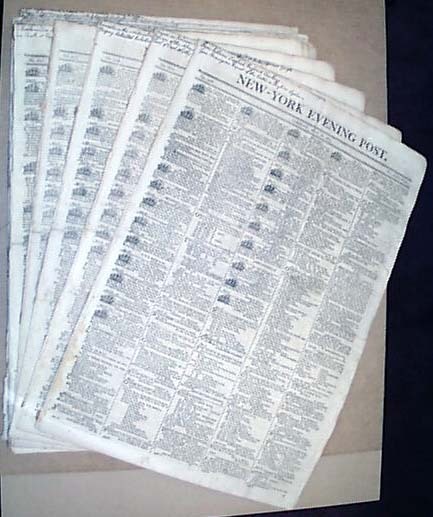 The New-York Evening Post was founded by Alexander Hamilton. The issues within this set are from the first few years after his death. The newspaper is still published today as the New York Post, and is owned by Rupert Murdock. The image shown is a stock photo which is representative of the issues you will receive. Actual dates vary, but will all be dated in 1806.